In 10-inch nonstick skillet, melt butter over medium-high heat. Sprinkle halibut with lemon-pepper seasoning; add to skillet with onion. Cook and stir 2 to 3 minutes or until halibut is white and no longer opaque. 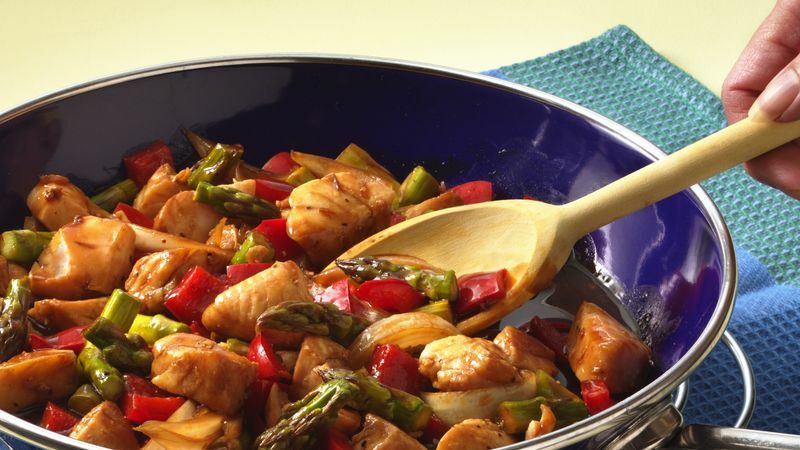 Stir in asparagus and bell pepper. Cook and stir 5 to 7 minutes or until vegetables are crisp-tender and halibut flakes easily with fork. In small bowl, mix stir-fry sauce, lemon juice and honey. Add to mixture in skillet; cook and gently stir until well blended and thoroughly heated. Serve over hot cooked rice. Serve this spring stir-fry with white or brown rice. Use quick-cooking rice if you're in a hurry. If you use regular rice, start it cooking before you start the stir-fry. Long-grain white rice cooks in about 20 minutes; brown rice needs 35 to 40 minutes.